Author and Historian Allan Mallinson. 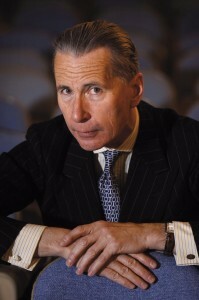 Museum Director Michael Telzrow recently interviewed Allan Mallinson, one of Britain’s foremost military historians and defense commentators whose book, The Making of the British Army (2009) was described by Antony Beevor in The Times as the acutest study of the army in a generation. Serving for thirty-five years in the army worldwide, Allan Mallinson will be back in Madison to share his latest work, 1914: Fight the Good Fight, at the Wisconsin Veterans Museum on Friday, November 21, 2014 at Noon. This program is free and open to the public. MICHAEL TELZROW: A lot has been written about British military history. Why did you feel you needed to write 1914:FIGHT THE GOOD FIGHT? ALLAN MALLINSON: The centenary of the First World War – 2014-2018 – is designated a national commemoration in Britain. Unsurprising when six million men were mobilized from a total population (including, then, the whole of Ireland) of 45 million, of whom over 700,000 were killed. Virtually every family in Britain whose forebears lived here in 1914 counts a great-grandfather, grandfather or even father who fought. And a great many books have been written about the war. Most of them, however, focus on the trenches of the Western Front, and, naturally given the huge expansion of the army, on the volunteers who flocked to the colours in 1914, and, later, the conscripts. Too little has been written about the old regular army which “held the fought” in the first three months’ fighting in 1914, a period not of trenches but a war of movement. My book addresses that deficiency. MICHAEL TELZROW: How did your military service inform your writing, or not? ALLAN MALLINSON: In the same way that you’d expect a surgeon’s experience to inform his writing about surgical procedure. The soldier’s advantage is that he tends to be able to read between the lines better, and to have an instinct for when there’s something missing. MICHAEL TELZROW: World War I is largely forgotten here in the United States, maybe not in Britain. Why do you think World War II has eclipsed World War I in our collective memories? ALLAN MALLINSON: See the answer to the first question: it hasn’t been largely forgotten in Britain – the wearing of poppies each November, culminating in the Remembrance ceremonies on 11 November, the day the First World War ended, is an annual and very poignant reminder. It’s the commemoration of all servicemen killed in action in the past century; but it began with 1914-18. MICHAEL TELZROW: Why did the British command miscalculate the time it would take to defeat the Germans in WWI, or is this mistake that all Generals make at the beginning of a war? ALLAN MALLINSON: The question forms a large part of my book. Just about every mistake – political and military – that could be made was made. But in short, we believed it would be a short war because we didn’t have the resources for a long one. And not having provided resources for a long war before it started, we paid a very much higher price in the course of it. The American experience was rather different – about which I shall be addressing at The Wisconsin Veterans Museum in Madison on Friday, November 21, 2014 at Noon. Join me for this free program!